We just found out our child has a hearing loss. People are talking about communication choices and how we need to decide. What is this all about? We aren’t sure, but our child may have other needs too. How can this affect our choices? There are many resources available that provide information about how you can communicate with your child. In addition to the information below, you are urged to contact Hands & Voices, a parent-driven organization that understands and has information to support you as you consider communication choices. A wonderful resource from British Columbia features young people with different levels of hearing loss and different communication methods can be viewed here. They talk about their parents, interests, educational experiences, use of technology and advice for new parents. Take time to view this informative and inspirational 24 minute video! Click here for video samples of different communication choices/options. Through Deaf Eyes is an almost 2-hour video that portrays the history of deaf education and views of people who themselves are deaf. There are a large number of people who are very committed to the idea that all children with hearing loss should learn sign language. There are also a large number of people who are very committed to supporting every child in learning to listen and use spoken language. Below are two articles that discuss these differing views. Whatever communication option a family will use consistently is the correct choice for the family. The brains of babies and young children are programmed to learn the language (or more than one language) that is made accessible to them. As the child develops and learns, their style and rate of learning may result in the need to rethink how the individual child may learn to communicate best. Communication options – change as needed: Communication Building Blocks – This handout lays out the different ways children can learn to communicate in a way that helps families understand that their choice does not have to be permanent and can change as their child’s needs change. Making eye contact is the most powerful mode of establishing a communicative link between humans. Research results show that, from birth, human infants prefer to look at faces that engage them in mutual gaze (they like to be looked at!). From an early age, healthy babies show enhanced neural processing of direct gaze (more brain activity = more brain gr0wth). The sensitivity to mutual gaze demonstrated at 2-5 days of life shows that it is the major foundation for the later development of social skills. PREDICTION: Infant smiles tell us about how infants will develop. Four-month-olds who smile more in response to a mobile, show a more exuberant temperamental style at four years when they are more likely to talk and engage with peers. Infant smiling in response to a brief period of parental non-responsivity (when the parent stops normal play to pose a “still-face”) may indicate emotional resilience. In comparison with infants who did not smile, six-month-old infants who smile during the still-face are more likely to be securely attached at twelve months. Their parents also perceive them as having fewer behaviors such as being loud and rough than infants who did not smile during the parental still-face. Infants who smile when the going gets rough appear to develop socially appropriate relationships. Refer to the following for more detailed information on Smiling and Infant Development. Perspectives from the home…. I provide weekly services to a child who will turn three at the end of October. His mother is very young, but very involved. She really ‘bought’ my suggestion of the use of eye contact and smiling at him from our earliest sessions. He had at least a 40dB hearing loss at birth, as he was able to be identified through our newborn hearing screening program at the birth hospital. He now has a 65dB loss bilaterally. His amazing articulation (clarity of speech) and use of language may keep him from eligibility for further services…we’ll see! Yesterday, I saw a 2 year old. His mother read a short story with three pictures depicting the action in the story. When he retold the story, he missed some critical elements not shown in the pictures. While he could point to the correct picture while Mom was reading the story, he missed that the purpose of the story was to discover how this baby bear finally got warm. The child retold the story saying that “the baby bear wanted to go in a tree, sit on a rock, and went to his mother who hugged him.’” I then reread the story to the child and signed as I read. I then asked the child to retell the story again. This time he got several additional elements and was particularly interested in the baby bear wanting to get warm. The signing seemed to be a significant support in understanding and getting more out of this short story. For him signing seemed to be an important route to learning the details of communication. I have one other family whose 3 year old daughter has excellent articulation with fair use of language. 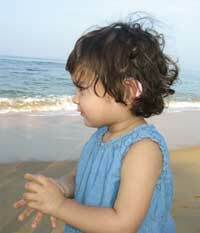 She was also identified at birth with a hearing loss and got her cochlear implants at 8 months. Her parents have been very mindful of eye contact and smiling. It has been wonderful to watch these children do so well. THE RULES OF TALKING – hang it on the refrigerator as a reminder of ways you can encourage your young child to talk. A Good Start: Suggestions for Visual Conversations with Deaf and Hard of Hearing Babies and Toddlers suggests research-based techniques for communicating with young children with hearing loss. Deaf children of Deaf mothers typically have age appropriate language levels at 18 months as compared to children with hearing loss who have hearing parents. This study considered what the Deaf parents are doing that results in these higher outcomes. Primary differences related to the way that parents got the attention of their infant/toddler before communicating. These attention getting techniques can be of benefit to any family of a child with hearing loss, regardless of the communication option used. Information about an App to Learn Sign Language: Sign language is the preferred choice for some families and/or the best mode to learning for some children. It isn’t always easy to learn though within a busy family’s schedule. The information about the Baobob App designed by Gallaudet University. It is the first of a series of three bilingual storybook apps, developed to help language acquisition and reading in all young children; in particular for those who are deaf and hard of hearing. This app is unique in the world since it was built upon findings of extensive research done on both hearing and deaf bilinguals. Past research demonstrated that early visual language experience with ASL aids reading acquisition in English and offers other important advantages for a deaf child’s linguistic, communicative, cognitive, academic, literacy, and psychosocial development. Communication for learners with additional needs: Characteristics of Children as Communicators – Some children have needs in addition to hearing loss (sometimes called Deaf-Plus). This can make communication choices seem more complicated. This chart is can be used as a guide for determining the characteristics of children who are most likely to function within each of the communication options. Does he have to wear his hearing aids? Really? He seems to hear okay! Early Intervention – What’s That?